Region’s Only Bitcoin Vending Machine Upgraded! The region’s only Bitcoin Vending Machine (located at 101 Deals Thrift Store) still looks the same on the outside. It’s got the same, bright, quick, easy-to-use interface. Internally, though. a major upgrade has been made. The machine is no longer relying on blockchain.info for sending customers’ bitcoin and instead is using its own full bitcoin node. Though it nearly always worked previously, it’s now going to be rock-solid-reliable. You can try the Keene Bitcoin Vending Machine for as little as $1. 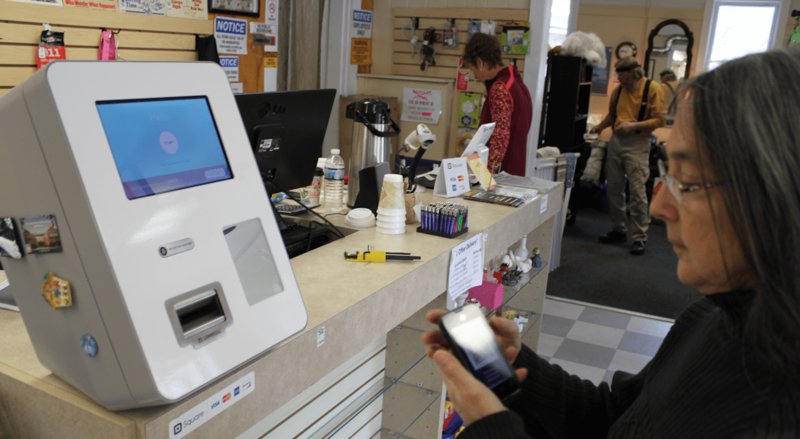 Just get a bitcoin wallet for your smartphone like Airbitz and drop into 101 Deals Thrift Store at 661 Marlboro St. in Keene from Tue-Fri 11a-5p and Saturday 10a-6p.